The Sugar Ant is the common name given to the ant species Camponotus Consobrinus. It is actually a subspecies of carpenter ant. The ants get their common name because of their affinity for sugar. Sugar ants eat wide ranges of sweet and savory foods, but they prefer sweeter foods. The ants are relatively large (One fifth to three fifths of an inch) and have easily identifiable banded bodies. They have black heads and mandibles and the rest of their bodies are orange-brown. Sugar ants are very common pests. They are considered pests due to their affinity for the food inside homes and their high numbers. The ants can bite, but their bites are not painful. They cannot sting. Sugar ants are found around the world and are highly common in the United States and Australia. They are found in dozens of different habitats ranging from forests to urban areas. Their nests are also made in many different materials ranging from holes in trees to inside plan roots and in rock areas. Sugar ant nests are easy to recognize when built in soil as the workers leave all of the grains of dirt removed from the ground in large and created ‘hills’ outside the nest. Sugar ants are omnivores. They eat plants, honeydew secreted by aphids and caterpillars, left over food scraps, and both living and dead small animals. The ants will feed on almost anything they can forage or hunt. The ants have an affinity for sweet foods such as honey, sugar, jam and jelly, sweets, syrups, and so forth. 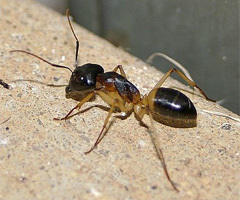 It is because of this affinity that Camponotus Consobrinus has been nicknamed the sugar ant. Sugar ants mostly forage, hunt, and work during the night. They can be seen during the day but this is less likely. Turning on the light in your kitchen at night and seeing ants rush for cover may be a sign you have sugar ants. In nature the ants often clear long distinctive trails between their nest and food sources. Sugar ants breed between spring and fall. Hundreds of thousands of reproducing ants swarm in the air while hundreds of workers keep guard on the ground. If you believe you have a sugar ants, you will want to locate the nest and eliminate the infestation.